Europa House is a prominent former head office building being transformed into 242 leading edge student beds. Facilities that students can enjoy while studying at the University of Portsmouth include a Cinema, Gym and Student Lounge. Academy is advising as Development Manager and is seeing through the development to completion in September 2017. 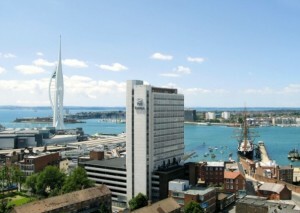 The building overlooks the iconic Spinnaker Tower, Gunwharf Quays shopping and leisure destination and the historic naval dockyard. Students will enjoy some of the most stunning views they will ever see with ferrys leaving for the Isle of Wight & trains and busses arriving at Portsmouth Harbour – just across the road on The Hard – that is now being regenerated as a transport hub for the city.